This recipe for Orange Ricotta Almond Tart is the creation of Chef Putnum Yost, the executive chef of The New Sanno hotel in Tokyo. It was sent to me by my good friend and his brother chef Charles Yost. I haven’t tried this recipe yet, but it sounds delicious and I thought I should share it with you. I will be making it soon. Chef Yost also sent me a great description of how they make their ricotta cheese. I’ll add them both here. “Our fresh Ricotta is made the traditional way - from the whey of our mozzarella curds. But just what does this mean? When we make our mozzarella we coagulate the milk by adding selected bacteria (called cultures) and rennet (an enzyme that reacts with the lactic acid that is produced by the milk) so that our milk soon resembles a vat of white jello or yogurt. Once the milk is coagulated we pull cheeses knives (actually frames stretched with stainless steel wires) through the coagulated milk to cut the curd into soft, little pieces. Immediately upon being cut, a cloudy yellow liquid called whey begins to come out of the curds. Because milk is mostly liquid, eventually there is a lot of yellow whey and a smaller amount of curds. When the curds are mature we stretch them with hot water to become fresh mozzarella. Simultaneously we drain off the whey and heat it. When it is almost boiling, we add an acid that precipitates the remaining solids in the whey. This is evident when soft, white frothy curds of Ricotta float to the top of the vat of hot whey. We use perforated ladles to scoop these curds into basket molds imported from Italy. After draining overnight, the baskets are inverted and we have heavenly cakes of Ricotta that weigh about 3 lbs each. Our Ricotta is very low in fats and calories and a wonderful cheese for cooking or just eating: for breakfast or dessert drizzled with honey and sprinkled with cinnamon or toasted nuts or as a savory dish drizzled with extra-virgin olive oil and sprinkled with black peppercorns or fresh herbs. Spread almonds on a cookie sheet and bake until light brown. Remove and set on a rack to cool. Grind almonds into a fine meal in a bowl or food processor. Add the eggs, ricotta, sugar, orange zest,orange liquor, vanilla and nutmeg. Process until well mixed, smooth, and fluffy. Pour the batter int the dish, filling almost up to the top of the pan. The tart will puff up while baking. Remove and place on a rack to cool for 1 hour. Set aside and refrigerate for at least 1 hour. For the topping, peel the zest from the oranges and cut into long, very thin strips. Be careful to remove only the peel and not the white pith underneath. Combine the water and the sugar in a small saucepan. Bring to a simmer over low heat, add orange zest and cook slowly for 1 hour. If syrup becomes too dry add a little more water. Turn off heat and add cinnamon stick. Set aside. Just before serving time, remove the candied orange zest from the syrup and shake off the excess syrup. Reserve syrup and set aside. Place 1 tablespoon of sugar on a piece of waxed paper. Place the zest on the sugar an toss well to coat with sugar. 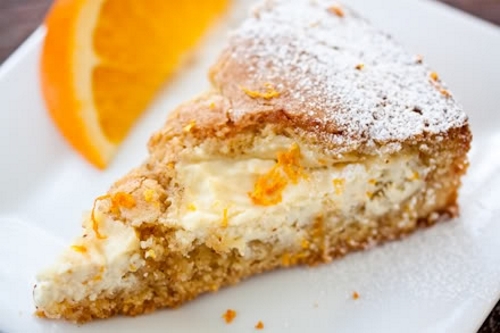 Place orange rind on the top of the tart and distribute evenly over the tart. To serve, cut the tart into wedges. Place on serving plates, top with a dollop of Creme Frauche, and drizzle a reaspoon of the reserved syrup on top. Garnish with mint leaves.